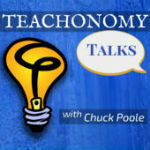 In this episode I delve into how to keep Focus, take Initiative, and be Tenacious as a teacher. I also include a separate "workout" for each point that you can try right away. Listen today and be encouraged to Teach F.I.T.